Sometimes I like to go back and visit a project or a plan a couple months after a release. By this time we’ve usually heard from the public, yet it’s lost a lot of its freshness, making it easier to see past the pretty renderings. Back in July of this year, the Greater Springfield Chamber of Commerce in conjunction with a planning grant from the Community Foundation for the Land of Lincoln’s Historic Preservation Fund, released a conceptual plan for the underutilized Jackson Street on the south-side of downtown Springfield. What makes this project significant is that it’s anchored by two of the most active and iconic nodes the city has to offer, the Illinois State Capitol to the west and Abraham Lincoln’s home to the east. Sprinkled in between those destinations includes Obed & Isaac’s Microbrewery, a very popular local hotspot and the Governor’s Mansion. What they all have in common is Jackson Street frontage, which lacks any type of identity, however contains unlimited potential starting with the vacant YWCA parcel and the future of the Third Street Rail Corridor transformation into a greenway. Revitalization efforts of Downtown Springfield are significantly behind other cities with comparable populations and density, but thats another very lengthy blog post for another day. I don’t want to focus so much on the project highlights as the Illinois Times and State Journal-Register articles do a great job of that. Rather, how does this conceptual design promise a better outcome than the aesthetically beautiful, but often vacant Capitol Avenue one block north? The “pedestrian” focus is something lacking in Springfield and should be welcomed with open arms. 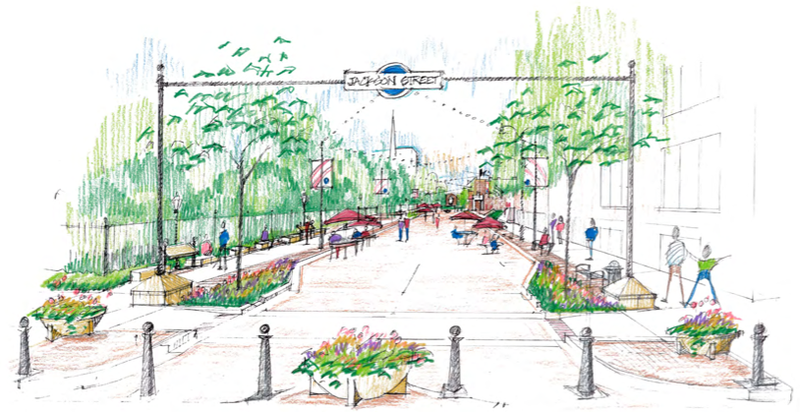 The renderings of the streetscaping and canopy of lights provides an intimate space unmatched anywhere else in the city, but are we doing an injustice to the process for not thinking big when Springfield is lagging so far behind other cities in prioritizing its urban core? By no means is this a critique of the Massie design, but rather a thought provoking exercise in building upon an already forward thinking plan. Can you program this space while maintaining the flexibility? Outlined below is a “menu” of three potential yet practical strategies aimed at doing just that to preserve the long-term sustainability and vibrancy of the proposed corridor. The term daylighting is used to describe the restoration of rivers or creeks that have been covered up with concrete, usually as a result of past public works in urban areas. 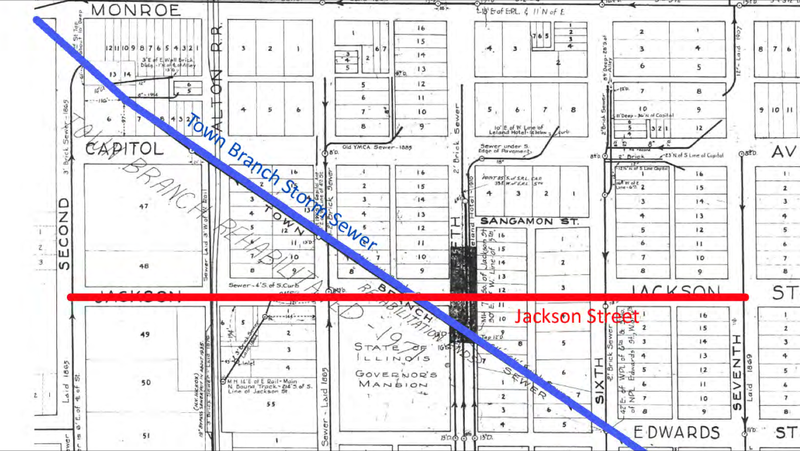 Most would be surprised to know that a creek (Town Branch) once ran through downtown, but was covered as a stormwater sewer. While this is the most ambitious strategy among the three, it has the most significant opportunity for impact. This catalytic project most likely would be a very expensive endeavor, however the enormous ecological, economical and cultural benefits could very well outweigh the cost…not to mention this downtown is in dire need of exposed water among all the concrete and hard surfaces. As you can see from the picture above, the Saw Mill River in Yonkers, New York is a success story among daylighting projects. After finishing Phase 1 of this project this site has already spurred a Manhattan businessman purchasing $30 million of property adjacent to the river. He is planning a 22-story, $150 million office and residential tower called Yonkers Rising. Tech company Mindspark is expected to open offices near here with 180 six-figure salary positions. Yonkers is not the only daylighting economic success story, as Arcadia Creek in Kalamazoo turned a parking lot into a 3/4 mile park that hosts five annual festivals and generates $12 million in annual tourism dollars. Much like these two projects, a surface parking lot sits where the Town Branch Creek meets Jackson Street and could share the same type of potential. Basically, daylighting the Town Branch can help downtown Springfield reduce flooding caused by under-capacity culverts, it is often cheaper to open a channel than to put a new pipe back in the ground, near-by businesses benefit from the draw of occupiers, property values go up as people want to be near water, and water quality improves from sunlight and air. This would not only be an asset to Jackson Street, but downtown, the city and the region as a whole. This response is very progressive for a community like Springfield that continues to sprawl. This reaction was most likely brought upon by a rendering that reflected more physical right-of-way space to vehicles, yet was labeled pedestrian friendly. The problem with pedestrian malls is that 89% in America have failed…not really a risk that Springfield can take at this point resourcefully or financially. The happy medium might fall with what the Dutch call a “woonerf”, where pedestrians and cyclists have legal priority over motorists. A woonerf could be best explained where “sharing the road” is taken literally. Imagine cyclists and pedestrians walking in the middle of the street. However, if a motorist chooses to drive down the street, they have to be more aware and fall behind those that the street was designed for, thus creating a culture that could spill over to other streets downtown. There are often no curbs, no lanes, and no signage. 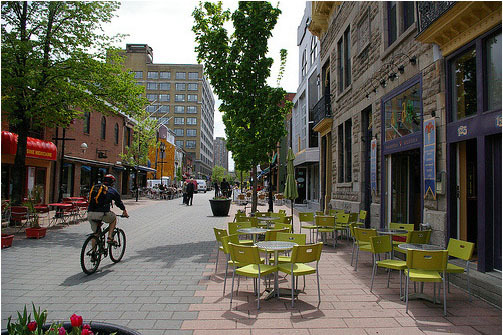 Zoned areas, such as street dining, are delineated by colors of permeable pavers as in the picture above. This might just be the “happy medium”, lower-risk alternative, yet true pedestrian focus desired by those in the community. 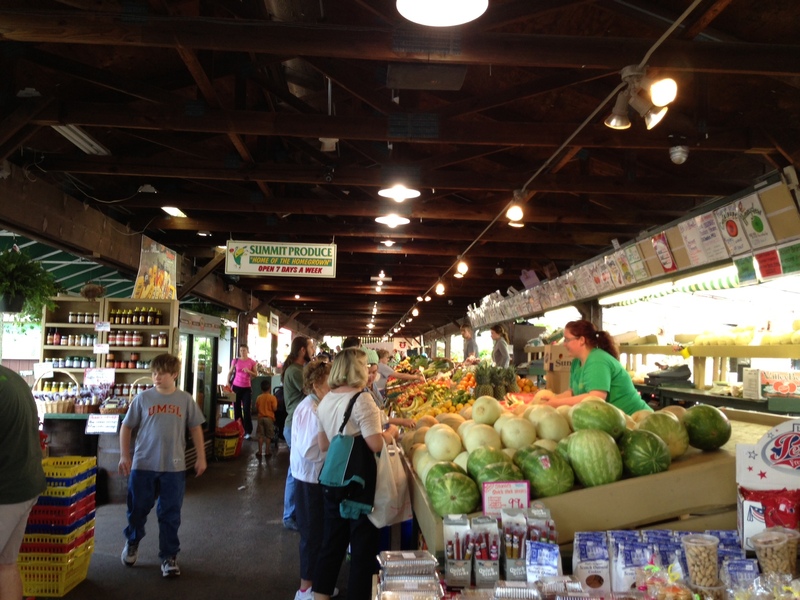 It’s no secret that farmers’ markets are community and economic development contributors. Between the years of 2008 and 2013, the number of farmers’ markets in the U.S. had increased 74 percent, from 5,000 to 8,144. In 2012, the Market Umbrella study claimed the median annual return for a farmers market was $3.4 million total economic impact on a community. That’s all great news since Springfield already possess a very popular farmers market downtown. However, the current farmers’ market only operates two mornings a week from May to October, requires closure of arguably the most vibrant downtown cross-street (Adams) and stretches across an at-grade railroad crossing. This opens up a vast amount of opportunity to establish a bigger and better version of the current one. That opportunity might just lie within the Jackson Street Corridor to assist with its long-term sustainability, vibrancy and connectivity. While the Massie plan focuses more on flexibility rather than programming, one of the five redesigned blocks comes with constraints. 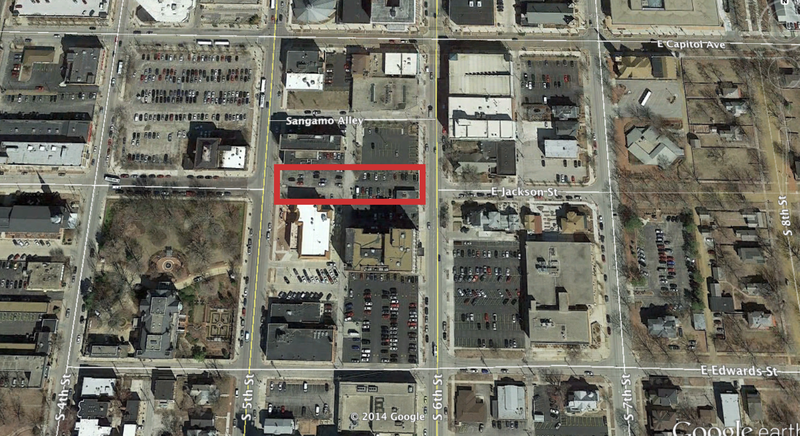 The block situated between 5th & 6th Streets is currently not a right-of-way, but a surface parking lot owned by the Illinois Association of Realtors. However, the surface parking lot presents a great opportunity to reconnect Jackson Street as a continuous corridor, all the way from 2nd to 7th Street. Some have suggested that the realtors association may have no interest in that stretch of Jackson Street turning into a street. However, just for a moment indulge me and imagine where a right-of-way would be. Now, replace that right-of-way with a pedestrian path with an open-air structure that could house vendors 7 days a week and shelter those from the harsh elements. There would be no more shutting down a street, waiting for a train to pass or closing down for the cooler months. This is an asset to the community that can sell produce when it’s warm, pumpkins and christmas trees when it’s cool. The location is ideal in that it’s walkable for many who live and work downtown and also gets a vast amount of attention, as it’s situated between the two main thoroughfares (5th & 6th) that carry locals and tourists alike in and out of the city. A former professor of mine, who was also the former Planning Director of Denver and Milwaukee always said something along the lines of…”for some reason the public settles for mediocre design, but as planners if we do a good job of showing alternatives and looking at implications of what the alternatives are, people will choose well”. In a nutshell thats what this post is about, providing a “menu” to the public as they often don’t know what menu items are even available to them. According to the most recent United States Census population estimates, only 29 of the 293 cities with populations over 100,000 declined in population between 2012-2013. Unfortunately, Springfield is one of those 29 cities…Time to make BIG Plans!